NO MERE GREATEST HITS compendium this. Rather, the initial volume of Jerden Records’ History of Northwest Rock series is an unparalleled aural chronicle of a distinct regional sub-strain of ‘60s rock ‘n’ roll, the original “Northwest Sound.” This compilation is intended as a kickoff point in an effort to dig back into the depths of the Pacific Northwest region’s big-beat roots. AN EPIC ARCHEOLOGICAL exploration of Seattle’s senior pop label’s master-tape vaults yielded this select set of twenty-one vintage rock tunes. It's a solid mix of long-lost regional radio classics, the nearly forgotten, and the absolutely unknown. Certainly a number of the area’s premiere early-‘60s combos are represented here by their best-known hit(s), but equally swingin’ are the other selections which were strictly commercial flops upon their original release. The remaining couple gems have rested in the can unheard by human ears for three decades. Enjoy. As you'll hear: The rockin’ teen-R&B sound that developed in the Pacific Northwest was an aggressive jazz-tinted offshoot of ‘50s West Coast Rhythm & Blues traditions – as exemplified by the likes of Ray Charles, Freddy King, Big Jay McNeely and Richard "Louie Louie" Berry – with a wild streak of Little Richard, Bill Doggett, James Brown, and Peter Gunn all thrown in for good measure. And so it came to pass that this provincial brand of dance music would rely heavily on pounding pianos (and then later the oomph of a big Hammond b-3 organ), squalling sax solos and/or rich horn choirs, tight drumming, and proto-Spaghetti Western blues guitars, all melded into ensemble workouts that were executed with all the finesse of a runaway night train. Around 1959 the whole thing got chuggin’ along here in the Northwest when a slew of local teenaged combos suddenly managed to hit the Billboard and Cash Box charts with their debut 45s. All within a few months time-span, a string of solid hits were racked up by Seattle’s Frantics and Ron Holden & the Thunderbirds, Tacoma’s Little Bill & the Bluenotes, the Ventures, and the Wailers, and Olympia’s Fleetwoods. Indeed, the Frantics and the Wailers would both score twice that year. The Fleetwoods finished out '59 with four major hits. The Wailers and Holden were handled by established New York or Hollywood-based labels so their success was at least imaginable. The miraculous feat, however, was that the other four of these acts had been independently produced in Seattle by a tiny startup company called Dolton Records. For a fledgling label based out in the cultural backwaters, Dolton’s international success was phenomenal. And for a truly magic season or two the firm could do no wrong. The size and goals of the operation expanded in step with their meteoric rise and eventually the label would abandon the local scene, relocating to Los Angeles. While still in town, though, Dolton served as the perfect model. And thus, in the wake of all this action, scores of other mom & pop record companies quickly sprang up. It seems that overnight everybody and their brother suddenly thought that they, too, could pick hits. Dolton had made it all look so easy after all and now everyone was an expert. And, of course, every “talent” around was set on booking a session at the facility where all these hits were being cut: hobbyist Joe Boles’ home studio in West Seattle. In the midst of all this excitement hit-singer/producer Bonnie Guitar – who was one of the label’s principals – jumped ship in the early ‘60s, taking along a young promo-man, Jerry Dennon, and the duo launched their own label, Jerden Records. The very first combos that Jerden signed were the Adventurers of Seattle, the Exotics from Kent, and the Checkers who hailed from the Lower Yakima valley. The latter band featured Larry Coryell, who would later make a name for himself in the jazz world. Nevertheless, neither the Checkers’ Jerden 45, “Soft Blue,” nor the Adventurers’ “Little Genie,” nor the Exotics’ “Four banger” managed to strike the pop hit jackpot. The label had an inauspicious start; within a few short months – and after only issuing a handful of 45s – Jerden folded. Dennon and Guitar each went their own separate ways – to the music biz in Hollywood. Meanwhile, over the next couple years the Northwest’s rock ‘n’ roll scene would flourish. The long-standing school-based sock-hops were augmented by the first commercial teendances thrown at old dancehalls and roadhouses like Seattle’s Parker’s Ballroom and the Spanish Castle, Mount Vernon’s Seven Cedars, and Olympia’s Evergreen Ballroom. And Seattle's 1962 Century 21 World’s Fair injected a good deal of energy into the town’s economy. The local nightclub and teenage radio market both came into their own around this time period and opportunities for young bands generally expanded. By 1963 Dennon was back in town and Jerden was back in the game. Joe Boles had passed away and the label continued on recording local combos, usually downtown with engineer Kearney Barton at Audio Recorders. One of Jerden’s first signings was the Dave Lewis Trio. This act was without a doubt the singular indigenous talent to exert a major direct musical influence in the development of a regional rock aesthetic. Pianist/bandleader Dave Lewis had been the musical trendsetter on Seattle’s scene since about 1956 when his trailblazing combo toured the region billed as the “Northwest’s Greatest Rock ‘N’ Roll Band.” They may in fact have been the greatest. What we know for sure is that the Dave Lewis Combo was the first at just about everything. If not the town’s first teen band, they were surely the first with a Fender electric bass guitar. The town’s first killer horn section. And, for the record: years and years prior to any white kids ever picking up on “Louie Louie,” the Dave Lewis Combo was doin’ it to it weekly at the regular Central District gig at the Birdland danceclub. The combo hipped alotta local musicians (including young Jimi Hendrix) to alotta things in the years before they dissolved at the decades end. Then Lewis resurfaced playing the electric organ in a killer R&B trio with Dicky Enfield (drums) and ex-Adventurer Joe Johansen (guitar). These three players were to have an undeniable influence on legions of their contemporaries and many of Lewis’ originals became standards in the developing canon of classic Northwest Teen-R&B tunes. The trio really shows who’s boss on their Jerden debut 45, “David’s Mood.” Not only did the song prove irresistible to damn near every local combo with an organ, but it broke out as a strong radio hit all across the region. “David’s Mood,” however, never took off nationally though it did earn the trio a bigtime album contract with Herb Alpert’s young A&M label. One of Dave Lewis’ numerous instrumental tunes that became staples on the scene, virtually required of all bands, was “J.A.J.” In Seattle the Dynamics scored the hit but the version laid down here is by the Kingsmen. A Portland band, the Kingsmen actually also recorded Lewis’ “David’s Mood” and “Lip Service.” “Feel Alright” – yet another of Lewis’ dancefloor faves – is covered here in a previously unreleased version by the Counts. A Seattle band that had formed back in ’59 at Ballard High School, the Counts by this point were a top draw on the dance circuit. Certainly a cool bunch of tunes, and ones that serve as a fine and proper introduction to the subject. Yet by any measure, Jerden Records’ greatest mark in all musicdom was made in mid-’63 with the label’s release of that infamous and immortal 45, “Louie Louie,” by the Kingsmen. 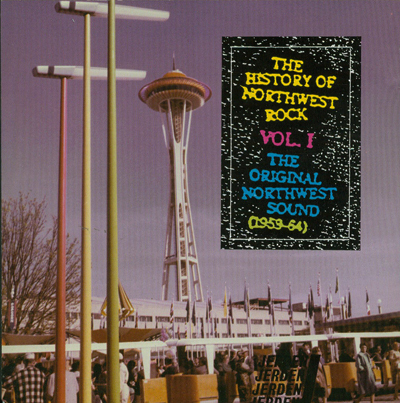 But, well, we’ve raced a little bit ahead of our story’s pace – to sync up again you’ll want to head ‘Back To The Garage’ with us on the History of Northwest Rock Volume II (Jerden 7007).